We provide this printable outline maps of the world shown that can be easily downloaded and printed as .pptx or .pdf World Maps. This World Map PowerPoint template can be very useful, for example, if you want to make: a personal travel plan, global strategy, teaching materials, etc. This Map template is appreciated by a lot of people, who are creating their own PowerPoint presentations. For example by Teachers that can project the images via their computers or overhead projectors to display the maps on the screen in their classroom. It's easy when they can point out those countries on the maps and call on students to name them. It's also suitable when you are a businessman and need to make a presentation in which countries you are selling your services or products, or want to show where your distributors are. Check out these great maps when you need the geography of continents and countries. We have done lots of hard work already for you. We have an entire team of visual consultants & designers searching, designing and optimizing PPT templates to provide for your convenience. Also, we have lots of donation presentation templates available online. You can also download professionally designed .ppt and .pptx files to increase your productivity. Here you find a large proportion of our collection of free and premium PowerPoint templates. Every World map template has a brief description with the download link. If you want to learn more about the templates, check it out now. Using this World Map Outline makes life easier. You will see that finishing a strong presentation has never been easier! 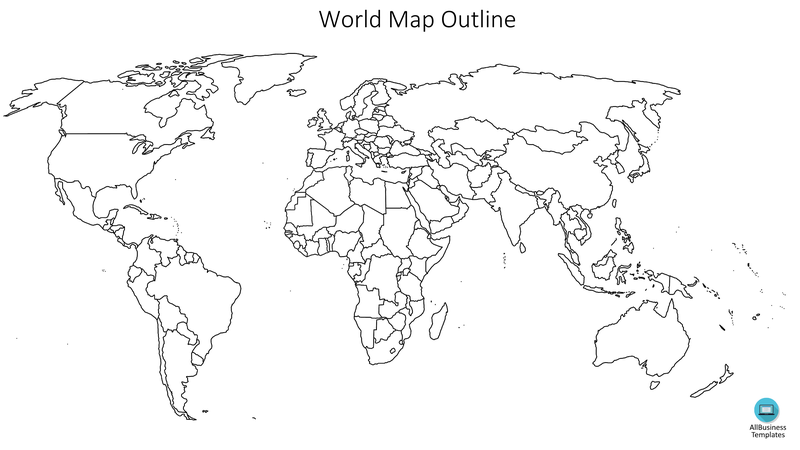 Download this World Map Outline PPT now!